Breakfasts just got a whole lot more exciting. 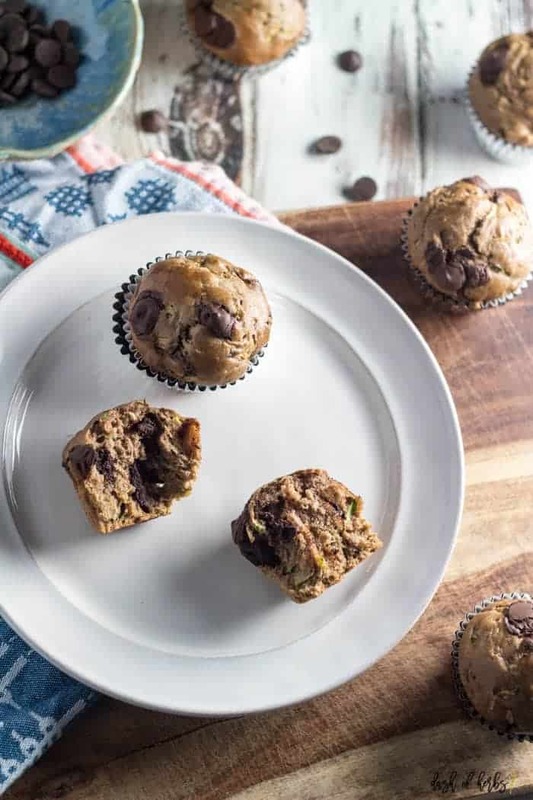 These chocolate chip zucchini muffins are perfect for a breakfast that you can make over the weekend and eat during the chaotic weekdays. 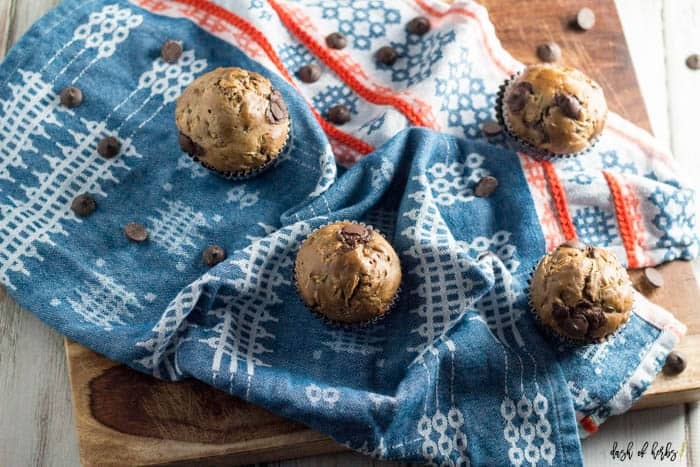 Easy, delicious and chocolately are the best way to describe these wonderful muffins. 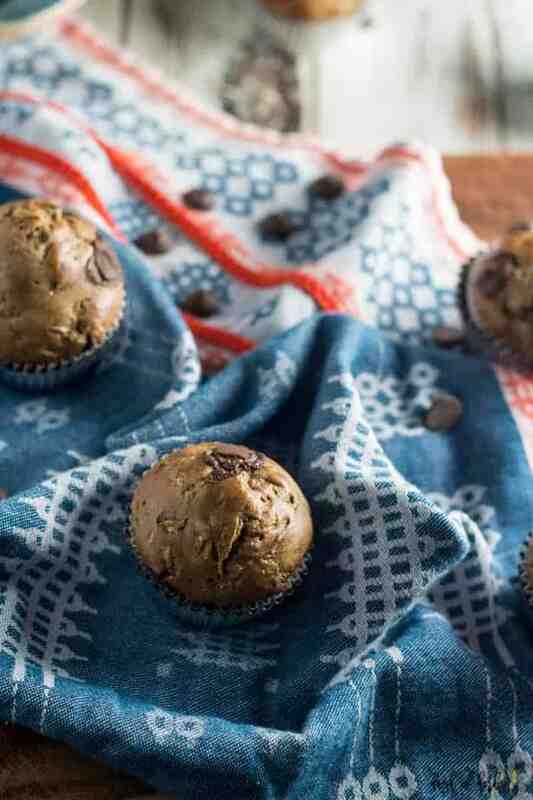 This recipe is 5 Freestyle points per serving, 1 muffin. Who doesn’t have a lot of time in the mornings to make breakfast? 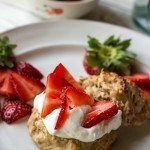 Or are you one of those people who believe they will lose weight if they don’t eat breakfast? 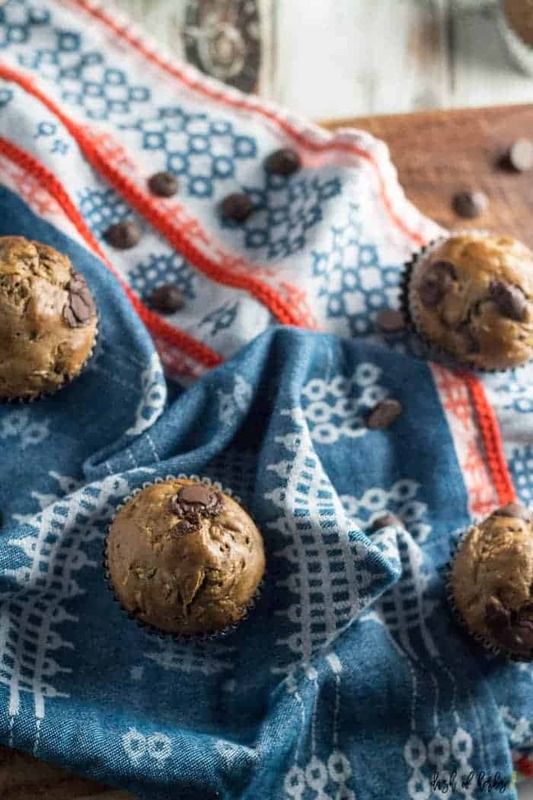 These muffins (and a bunch of other muffins) can be made on Sunday afternoon and are ready for a quick grab and go breakfast recipe. I love that you can prep these ahead of time and just grab them and go in the mornings. You could even pop them in the microwave to warm them up a little bit before you head out the door (I recommend doing this). They are so wonderful and so easy to throw together. 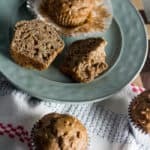 If you aren’t a fan of chocolate chips or zucchini, you might like this banana nut muffin, or these skinny french toast muffins. When you have a great chocolate chip zucchini bread recipe, and get requests to adapt it into muffins, you listen. These muffins were created because of the requests I kept getting from you guys on making the loaf recipe into muffins. I did make some adjustments to the loaf recipe to make these perfect for muffins, but they are similar. I mean, why mess up a good thing, right? One thing I didn’t change was that these muffins also have no added sugar in them. 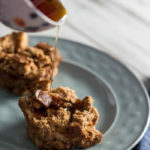 The chocolate chips add plenty of sweetness, as does the maple syrup. Why don’t you try these for yourself? Preheat the oven to 350 degrees. Line a regular-sized muffin tin with cupcake liners and set aside. In a large bowl, whisk together the dry ingredients. In a small bowl, mix together the wet ingredients. Add the wet ingredients to the dry. 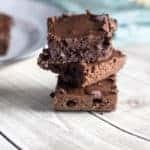 Fold in the zucchini and chocolate chips. Scoop the batter into the cupcake liners to about 3/4 full. Bake for 30-35 minutes, or until an inserted toothpick comes out clean. Let the muffins cool for about a few minutes before you serve. What are your go-to quick grab and go breakfast items? 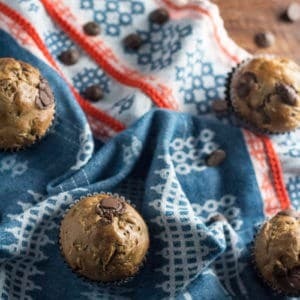 This recipe is 5 Freestyle points per serving, 1 muffin. Scoop the batter into the cupcake liners to about 3/4 full. Bake for 30-35 minutes, or until an inserted toothpick comes out clean. Let the muffins cool for a few minutes before you serve. They are so good. I loved making these and they tasted wonderfully. I hope yours turned out as tasty. I just made something similar that will be on my blog tomorrow. I can vouch for deliciousness!